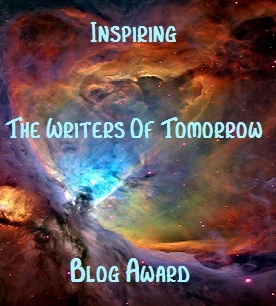 I'm very honoured to be the first ever to get the Inspiring The Writers Of Tomorrow Blog Award "for being an exemplary place for other writers to visit for how to advice, inspiration, and/or help with their craft. Thank you for your service to the reading and writing world and all your fellow writers and authors!" The award is for my Writers and Authors site. This is a fantastic site run by Author Karen Cioffi and includes a huge amount of valuable information, tips and advice for both new writers and accomplished authors as well as offering a platform to help authors promote themselves and their books. I came to Rome (Italy) for 3 days back in 2001 and ended up staying. I'm a full-time mummy to my 2 lovely sons, Matteo (4 yrs) and Lorenzo (1 yr). I've been a huge Winnie the Pooh fan since I was little. Set goals. They help keep you focussed. Get excited about your writing and marketing. It'll carry across in your work. Take risks. Don't be afraid to step out of your comfort zone and try something new. You might just find that you're well suited to it and gain some new fans. When marketing try not to go in for the hard sell. Instead offer a benefit or useful information that in some way connects to your book. And finally a big thank to Virginia Jennings for nominating me for this award. Well done, and well deserved. Congratulations. You are very welcome Jo! Where did you live before you 'visited' Rome? Pretty much everywhere in the South of the UK! I've always moved around a lot since I was little. I have 2 places I consider 'home' in the UK; Kent (Maidstone area) which is where I grew up and Reading which is where I lived before coming out to Rome. Jo, I'm so sorry I'm so late! I haven't been checking my Facebook page and just happened there now. Thank you so much for the nomination! We have great writers at Writers on the move and we strive to help others in the writing world. I'll get the award up at WOTM as soon as I can . . . and pay it forward.